Yuma International Airport is managed and operated by the Yuma County Airport Authority which was established in 1965. Our mission is to foster a safe and comfortable environment for people travelling through the airport?s terminal, engage and educate the community about aviation related opportunities and promote a business friendly environment. Aviation enthusiasts have enjoyed flying in Yuma since Robert Fowler first landed in Yuma in 1911. In 1925, the Yuma Chamber of Commerce helped secure land for an airport in Yuma and in 1928 President Calvin Coolidge signed the Yuma Aviation Bill and Fly Field was born. The Chamber?s aviation committee started lining up transcontinental and international air races where aviation greats such as Amelia Earhart competed. In 1939, the Yuma County Board of supervisors recommended Fly Field as a base for the Army Air Corps, which began Yuma?s rich history in Military Aviation. In 1949, local pilots Bob Woodhouse and Woody Jongeward flew 1,124 hours of continuous flight known as the ?Endurance Flight? in an effort to encourage the military to have a permanent presence in Yuma. Their mission was a success! In 1999, the airport?s current terminal was constructed with ample room for future growth opportunities. In 2007, the Yuma County Airport Authority and Marine Corps Air Station Yuma passed a resolution identifying the entities as ?Aviation Partners?. The result is that today is considered by many to be the best example of a Joint Use airfield between civilian and military operators in the nation. Forrest Clifford Braden was born in Eureka, Kansas to Arthur C. and Nellie Stewart Braden. He graduated from the Eureka public schools and entered Kansas University where he studied for two years. He was first in his family to attend college, his tuition consisting of $24.00 paid by his mother who scrimped and saved from selling eggs and butter. He left college during the depression to find work. Frosty’s hard work and determination led to starting an import/export business in Egypt, banana plantations in Costa Rica, and soft drink sales in Thailand. But it was his job as the Southwestern U.S. Credit Manager for the John Deere Plow Company that brought him to Yuma in early 1943 with his wife Margaret and family. Frosty was the owner of Braden Machinery Company, located first on 4th Avenue and 8th Street, and later a new building was built on the corner of 16th Street and Arizona Avenue. Frosty sold John Deere and Caterpillar Machinery into the agricultural valleys of southwestern Arizona, the Imperial Valley, and the Mexicali Valley of Mexico. In 1963, he and a partner took over the farming operations at Texas Hill Farms in the Wellton-Mohawk Valley. Texas Hill Farms has grown into one of the largest farming operations in the area. Its produce is shipped around the world. Never afraid of hard work, especially on behalf of his community and his state, Frosty’s service and accomplishments are many. The more difficult the project, the better, whether it was to build an art museum in the old train station, a program for troubled youth, a new St. Paul’s church, the Yuma Golf and Country Club or an underdog politician. He served on and chaired various boards, including Parkview Baptist Hospital Board, Arizona Western College, Advisory Director of Arizona Bank and Southern Arizona Bank of Yuma and Arizona Highway Commission are examples of his commitment. The F.C. 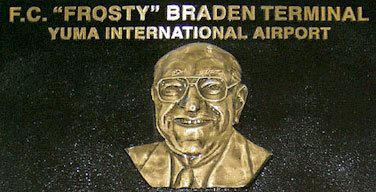 “Frosty” Braden Passenger Terminal recognizes his service to the Yuma County Airport Authority on which he served from 1970 through 2001, stepping down at the age of ninety-three. Frosty was a member of the Authority Board of Directors the entire time, serving as its President for five years. His leadership and influence marked the many improvements and developments at the Yuma International Airport. Frosty Braden made a difference with his life and influenced all who knew him.